Stop in for some old-fashioned entertainment and watch a hand puppet show. Wander in Yanaka Ginza, a charming shopping street in the area. Step back in time with us on this afternoon tour through Yanaka, one of Tokyo’s few remaining traditional neighborhoods with a rustic village feel and unique charm. Yanaka is one of the few neighborhoods in Tokyo spared by World War II, and while all the neighborhoods around it are on the fast track to modernization, the area has managed to preserve its old-fashion character, elegantly intertwining modern cafes with veteran shops that are hundreds of years old. 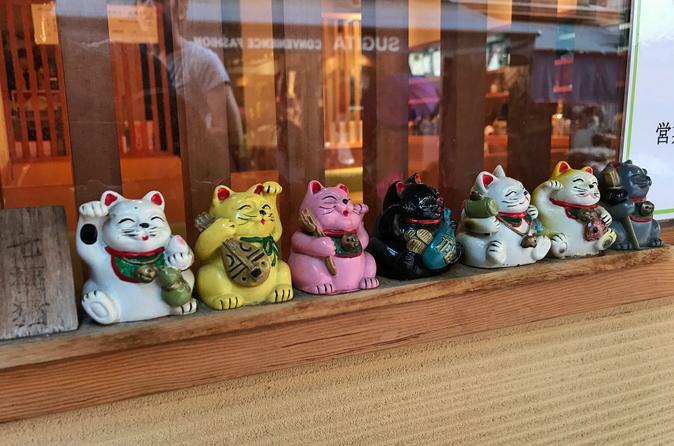 Together, we’ll wander through Yanaka’s narrow streets, home to an array of no-frill restaurants and artisans where you can find all sorts of Japanese treasures to take back home for friends, family, or yourself. We’ll stop in for some old-fashioned entertainment and watch a hand puppet show. Here they make original hand puppets called yubi ningyo, or finger puppet, and you don’t need to know the language to understand what’s going on as the stories are expressed through movement and gestures. You can stick around after the show and have the artist draw your picture and even order your own custom look-alike puppet. Afterwards, visit a traditional candy craftsman where they make candies in the shapes of different animals and characters for special occasions or simply to show off on Instagram. In Japanese, this candy-making process is called Amezaiku. It originated in the 8th century known as Japan’s Edo period. During this time, as a sort of performance, craftsmen would make their candy creations on the street to sell to the people in the neighborhood. Amezaiku became a unique form of entertainment enjoyed by all. Here you can choose the character you want, watch how they make it and take it home as a snack for later. The tour will wind down with a wander through Yanaka Ginza, a charming shopping street in the area. Along the street, you can see trades of all kinds, starkly contrasting each other such as the butcher's beside the barber shop, the confectionery beside the watch dealer. Some stalls even sell small snacks and finger food for as little as 50 yen. After the tour, you’re welcome to explore even more of Yanaka on your own or your guide can give you some great tips on how to spend the rest of your day. Your guide can give you directions back to your hotel or to your next destination.